During the Holiday Season we are reminded of the gift of giving and how important traditions, family, and history are to the fabric of humanity. 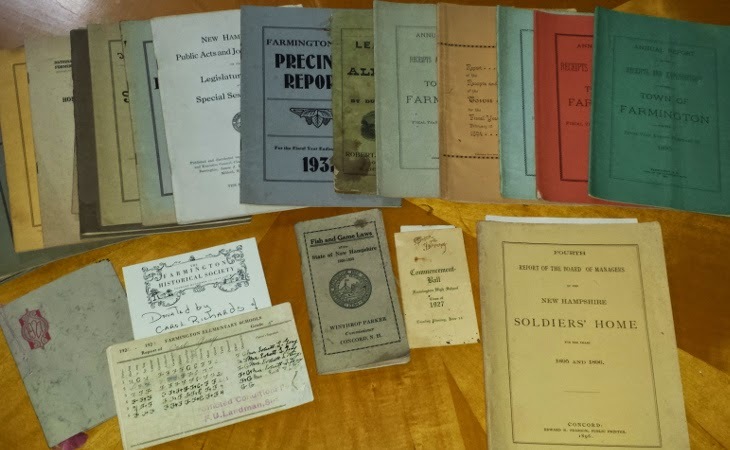 Over the years the Farmington Historical Society received many gifts, great and small. As the Curator for the Farmington Historical Society and of the Henry Wilson Museum. I'm delighted that those gifts, collected carefully over the years, have provided us with a rich, varied, museum collection that accounts not only for the happenings of our town over time, but testifies to the creativity, perseverance, and heart of our town. The photo above is a group of items given to us this month by Carol Richards of Farmington. The items range from very old school report cards to a New Hampshire speech pamphlet favoring national prohibition of alcohol. I am deeply appreciative of these items and want to extend gratitude to her generosity and the spirit of giving shown by all that donated to the Farmington Historical Society or Museum this year. I also want to thank all of the volunteers who have helped me begin the process of sorting and cataloging the physical collection for online consumption. I wish everyone a holiday season full of happiness and a new year full of joy.